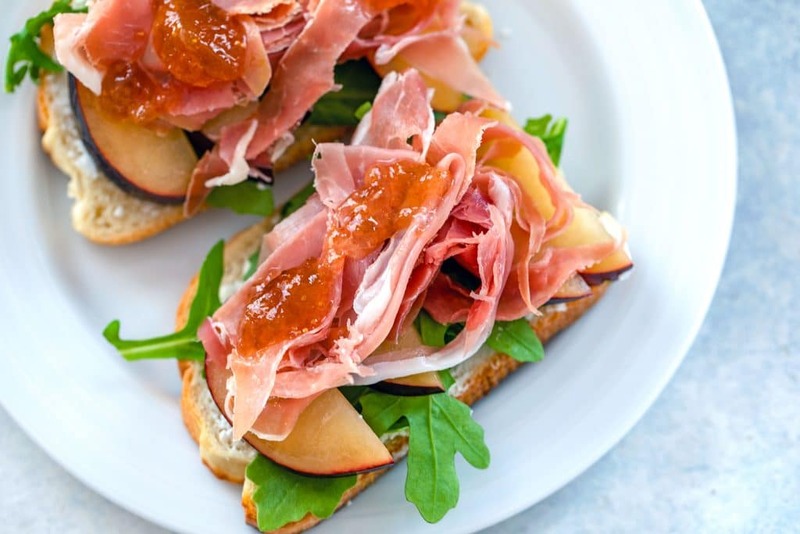 These Open-Faced Prosciutto and Plum Sandwiches make for an incredibly easy, light, and seasonal summer dinner that is likely just what the doctor ordered! 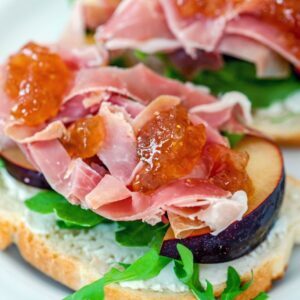 (This recipe for Open-Faced Prosciutto and Plum Sandwiches was originally posted in July 2011, but was updated with new photos in 2018). Like clockwork, every summer I go through a phase where my appetite is non-existent. It could be the hot weather. It could be my body telling me to chill out because I ate twelve times my weight during the winter months. Or this time around, It could be the fact that I just happen to be getting over a nasty cold/infection and have been on all kinds of medicine. I have no clue what it is, but I can easily have a bowl of oatmeal or cereal at breakfast have a small lunch and go to bed without dinner. And my stomach won’t growl at all and I won’t even feel a slight craving to eat anything. It’s bizarre. And also very annoying because I really love eating and cooking, but I hate wasting food. And to be quite honest, today was the first day in about two weeks that I took a real trip to the grocery store. I’m surprised there weren’t crickets in my refrigerator… that’s how empty it was. Even though I haven’t had an appetite, that doesn’t mean I just want to eat boring food. I very much wanted something delicious for lunch today and I was craving prosciutto and a cold sandwich, so I made an Open-Faced Prosciutto and Plum Sandwich. 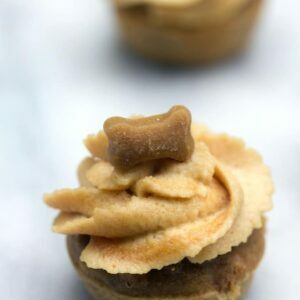 I about passed out when I saw the title of this recipe so I knew I had to make it! Sometimes I find that there’s nothing quite like a sandwich for dinner. That may sound a bit lame and boring, but it’s not like I’m over here eating PB&Js; you can get pretty darn gourmet when it comes to sandwiches! And sandwiches likes this one use high quality ingredients that when put together, make a totally complete meal. 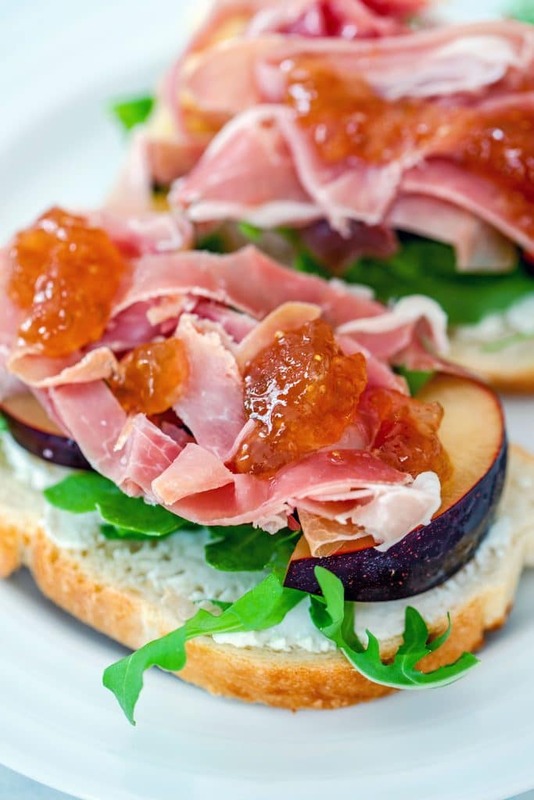 This open-faced prosciutto and plum sandwiches is also ridiculously easy to make, so you can come home after a long day at the beach or pool and have dinner on the table in no time! You start by jazzing up the fig spread. I mean, fig spread is pretty darn delicious on its own, but it’s made even better when you mix grated ginger and lemon juice into it! Also goat cheese. Spreading goat cheese on sandwiches is always a good idea. 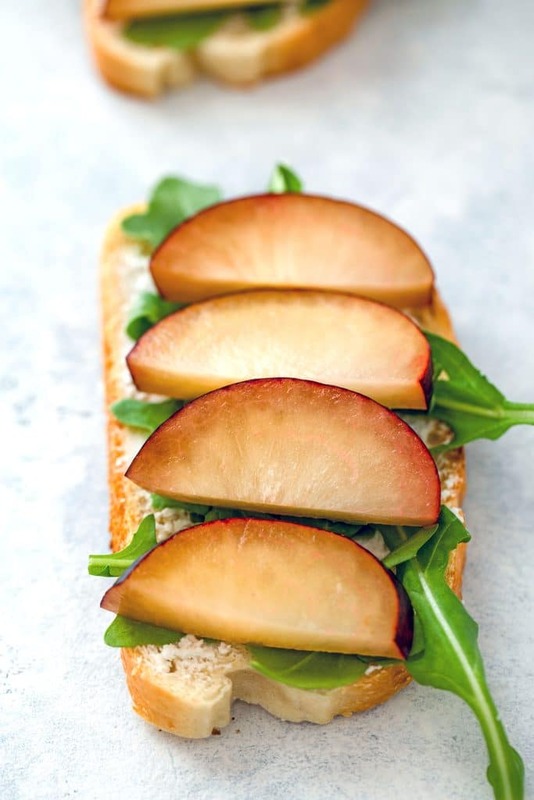 Once your goat cheese is spread, just layer on the arugula and plums. Then top with super thinly sliced prosciutto, drizzle that delicious fig spread over the top, and dinner is served. I told you it was easy. And I also promised it would be delicious. With the 90 degree weather, this was a refreshing sandwich and just enough to fill me up. The little spicy bites of ginger were most definitely my favorite part. And the soft goat cheese. Oh, and the salty prosciutto. And the little kick from the arugula. And the cold juicy plum. Mmmm, the whole thing was just great, okay? And it was mighty pretty to look at as well. As I was eating this I pictured it being served in a small bite as an appetizer, too. I just might have to make these the next time I entertain. I think they’d be a huge hit! I also think it would make a great salad if you wanted to nix the bread. So many options, really! I’m not usually a big fan of open-faced sandwiches (mainly because I love my bread! ), but there’s something so fun about them for summer. Especially when it’s a prosciutto and plum sandwich. This would not have looked half as beautiful with another piece of bread on top! 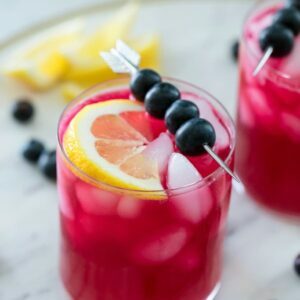 Yesterday afternoon I asked our followers on Twitter for suggestions for light recipes and I got a bunch of great ideas, so if they turn out to be blog-worthy, I’m going to be posting about them, too! 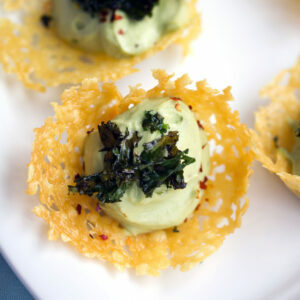 What’s your favorite dish to make in the summer if your appetite is lacking? 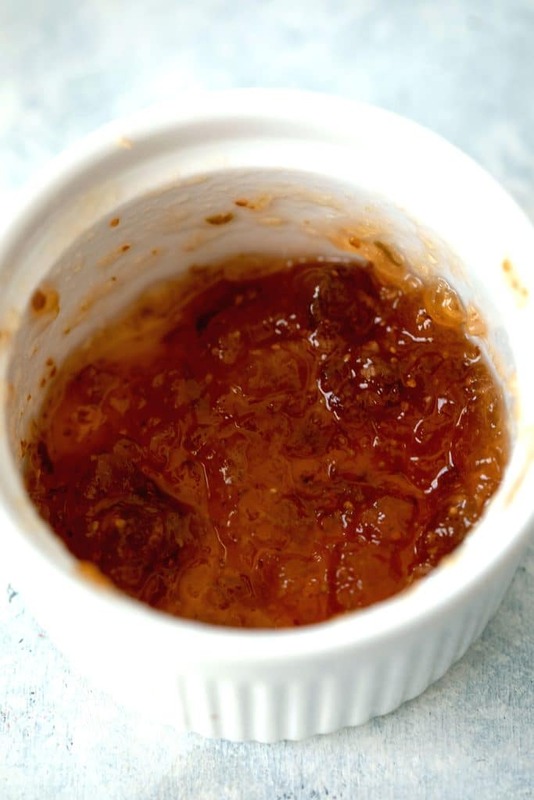 In a ramekin, combine fig spread, fresh lemon juice, and grated ginger and gently stir to combine. Spread goat cheese over each slice of the toasted bread. Evenly divide the arugula on each slice of bread. Top with sliced plums and sliced prosciutto. Drizzle the fig mixture on top. 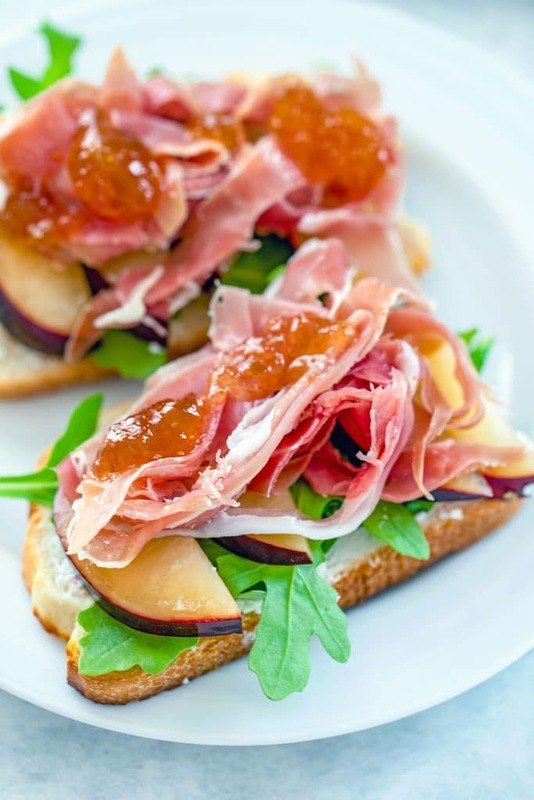 11 Responses to "Open-Faced Prosciutto and Plum Sandwiches"
Oooo, one of my favorite summer time additions to sandwiches is apple slices. I can see plums working the same way, and with the salty meat and cold cheese? Oh yeah! Aw, hope you are feeling better soon! A good caprese salad always hits the spot during the summer! 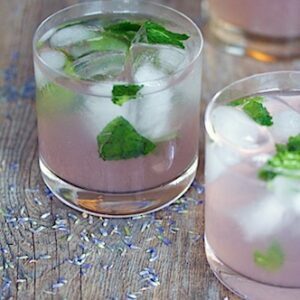 I think simple recipes like this are actually the best for summer! I hope you feel better soon! Yummy! If it wasn’t so darn hot, I’d love to make this into a melty panini! This looks fabulous! The hot weather makes me not want to eat anything but watermelon and popsicles. What a great sandwich! I’ve been eating arugula and peach salads this week! i know exactly what you mean! i haven’t been eating much more than salad and luna bars recently. i thought it was stress, but maybe it IS just summer 😉 glad you’re feeling better! I hope you are feeling better. I have been stressed and busy and generally blah about food, except for homemade salsa and chips lately. So I have eaten salsa and chips for several meals 🙂 This sandwich looks lovely. an awesome open sandwich, such a delicious combination with prosciutto and plums and that fig spread sounds excellent too. hope you’re feeling better.